To be honest having experience with all those hosting my best experience was and is with MelonCube. I have a Modded community that means that yeah i run modpacks like FTB Beyond(heavy modpacks) and all those hosting give me lag problem , meloncube is the only one that i can run 20+ people on and the server is free-lag. 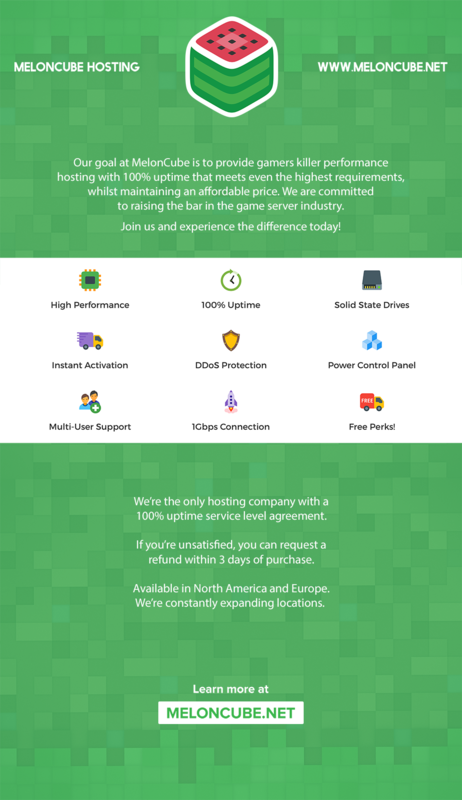 Customers support is one of the best part of this, they are pretty friendlys and fast, they reply to your ticket in like 30m probably less, so if i need to calificate this hosting i give you 9/10. they are the best at the moment but if you MelonCube read this, you need to improve or add plugin support, i mean sometimes i would like that support setup all my plugins and configure it, that is the only aspect that you need to improve, keep doing that good job guys. Do you have a test server? Can you still make manual backups even if you don't buy the automated backup option? They are all running our Zombie plan which comes with 1GB of RAM. In addition to that, we offer a 3-day money back guarantee if you are not happy with your server for any reason at all. You know what would be great? Cheap Asian server locations. This is a thorough review. Okies I don't usually do a review however when I do I review both positive and negative points so as to paint an overall picture. I will start with the negative which is not much. Billing cycle can be a little confusing but it does add up in the end. You purchase the server and addons in the same day however it seems to space apart the billing to two separate dates which breeds confusion. The other issue with billing is I advise purchase any upgrades at the end of the month and not the middle. My server went modded and needed more ram desperately but it made the costs go a bit higher and it makes more issues to figure things out. The last major issue I have with billing and services is I saw a clear way on how to add addons but there was no definitive way to cancel addons besides making a ticket and requesting it before the billing cycle. In my case I had a server for 4 years went into retirement for two and came out of it I was rusty so I had the advanced option ticked I didn't know it would be a little bit of a pain to get rid of after iv'e acclimated and knew what I was doing again. So if there are any complaints 1. Fix billing cycle a little bit and 2. Make it clearer to disable addons that you don't need. Now to the positives which are many but I will try to simplify. It is a really good service for the money I am running a 6 gig server modded with 25 mods and it runs like clockwork besides I think one of the mods having issues but that isn't host issue. Second positive point as of this review they do respond quite readily day or night I don't know what staff of magical fairy house elves they hired that can be around the clock but I have had issues at 2,3,4, 5 AM and sent in a ticket and day or night and even weekends it is usually a 15 minute reply. They are comprehensible and jump on issues really super quick. Server prices are good and I do advise getting the domain name just in case there is a host server issue and they do need to transfer you to another machine for some unknown issue such as a Daemon issue the domain name means you don't need to fork out a new IP to all of your players so it can keep a server stable. Performance of the machines they run like clockwork besides one of them having Daemon issues since we were moved which took barely any time at all we haven't had a single host side crash with a 99% up time (the last 1% was me adjusting modpack and such) so do I recommend them? Yes I do as a current and former server owner with 4 years past experience with heavily modded ram eating modpacks and simple easy vanilla modpacks this host is amazing and for the cost it may seem like a catch but there really isn't one. Not once in my career have I seen a server that can hold 150 players at 3 gigs of ram functioning like clockwork for vanilla that has a team this responsible and responsive for only 10 bucks and now with modded a 6 gig server with domain for 20 bucks and this team is absolutely amazing. besides their minor hitches 5 out of 5. I've been running a MelonCube modded MC server for only a couple of weeks now, but not had any major issues. I'm running Resonant Rise with a couple of extras. There's really only two of us playing but prior to MelonCube we were getting severe lag issues on new chunks and any amount of settings didn't appear to remedy it (upto 12gb), on MelonCube there's still the odd bit here n there, but nothing unexpected and it's tiny and we're only running on 5gb. Some of the original server's (not MelonCube) might be my issue but MelonCube is so damn simply, even using a manual jar was. However, where they really shine is their support. I've had to contact them twice, once because a mod was causing the server to crash each time - UniDict - still not sure why but they very quickly and efficiently pinpointed the error and I was able to fix almost immediately thanks to them. Still not sure why it happened, but reinstalling UniDict worked just fine. Secondly, I absolutely borked my world up and only had a backup after screwing it up. In an absolute panic I asked if they had a backup the day prior. They upgraded my backup addon to 2 days without any hesitation and my world was saved. More over, their responses were lightning quick. Great customer service is usually one reason people stay with a company, and based on my experience, while still very early, I don't intend to go elsewhere for some time. Prices are also good compared to competitors, I had tried someone else previously and got less than a quarter of what they offer for not much less than I pay now.